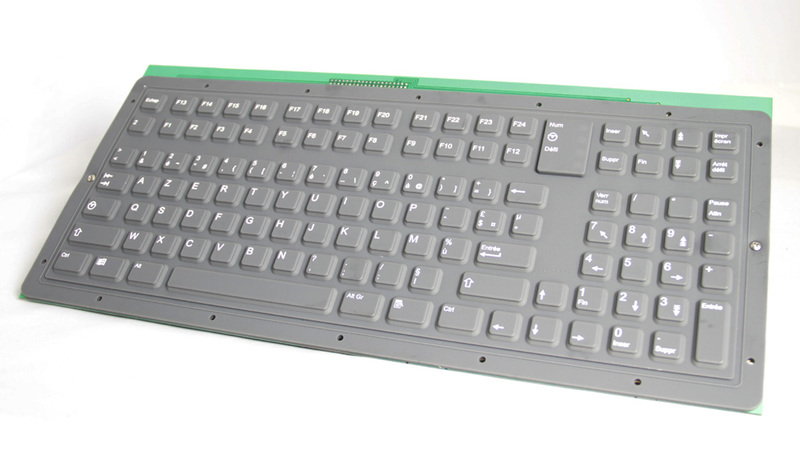 The KI8800 Series are ruggedized, NEMA 4 (IP66) sealing, industrial keyboards with full 101/104 key functionality in a full size design. 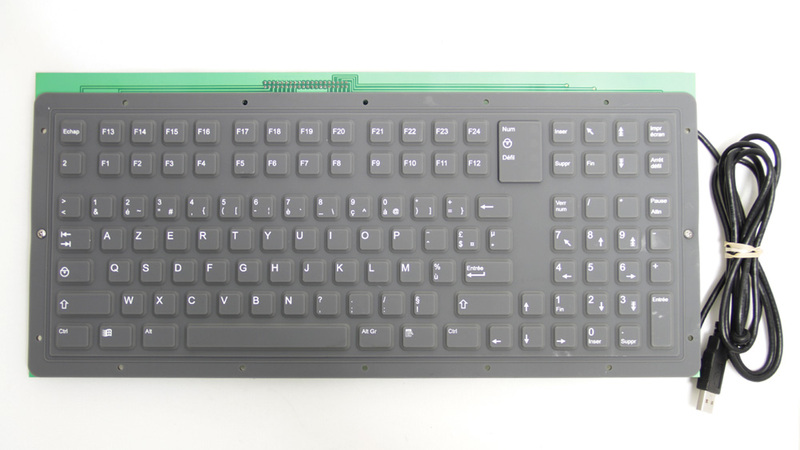 These OEM keyboards use CTI's advanced designs for sealing and reliability, are molded of silicone rubber and have 2 mm travel with excellent tactile feel. Gold over nickel contacts combined with superior sealing (waterproof) assure users of years of reliable operation. 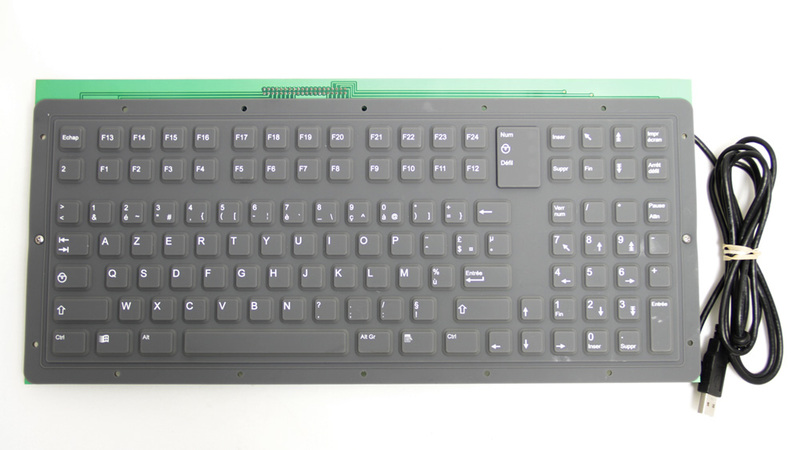 These OEM keyboards are a perfect fit for custom panels, and are an excellent solution for use in wash down areas; such as food processing, medical laboratories and machining factories. 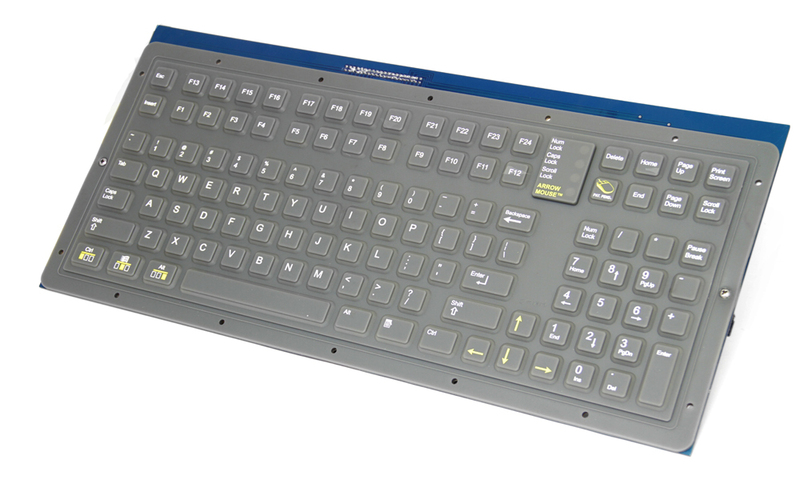 CTI's custom OEM keyboards are ruggedized to meet aerospace, medical, and military standards. 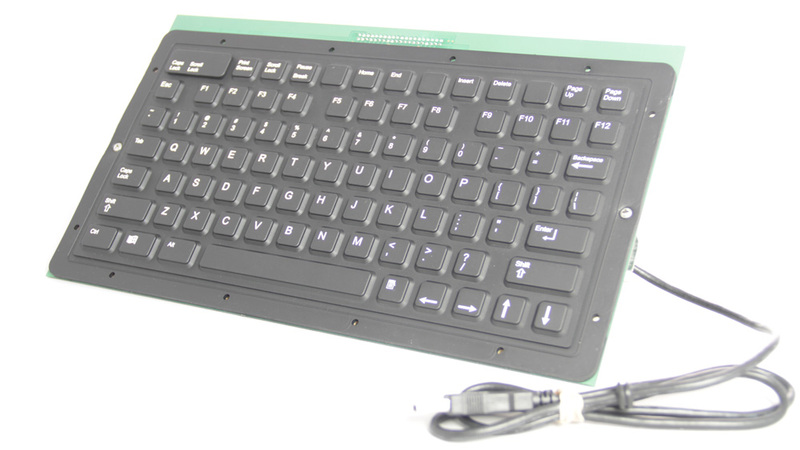 CTI's OEM keyboards can meet MIL-STD-167-1, MIL-STD-901D, MIL-STD-461F, MIL-STD-810G, and MIL-HDBK-217F. 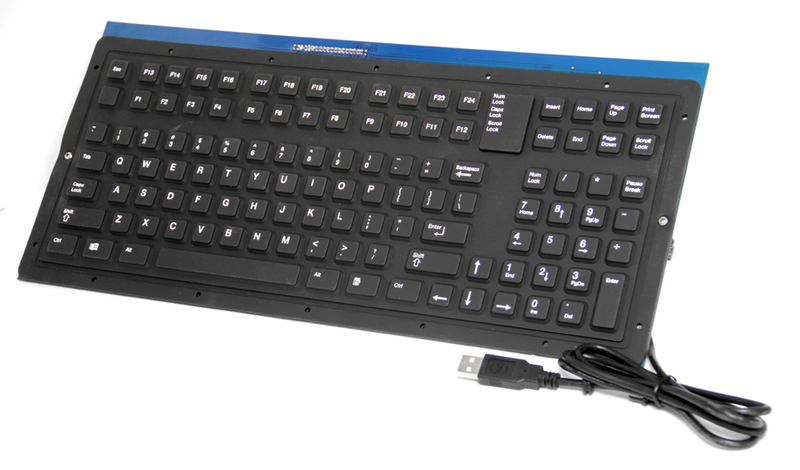 These OEM keyboards are able to withstand vibration, shock, high EMI/RFI levels, compliant for humidity, fungus, spray, and MTBF is greater than 100,000 hours. 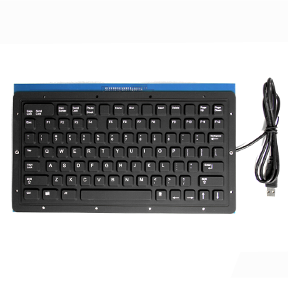 Thank you for selecting CTIs industrial computer peripheral products. 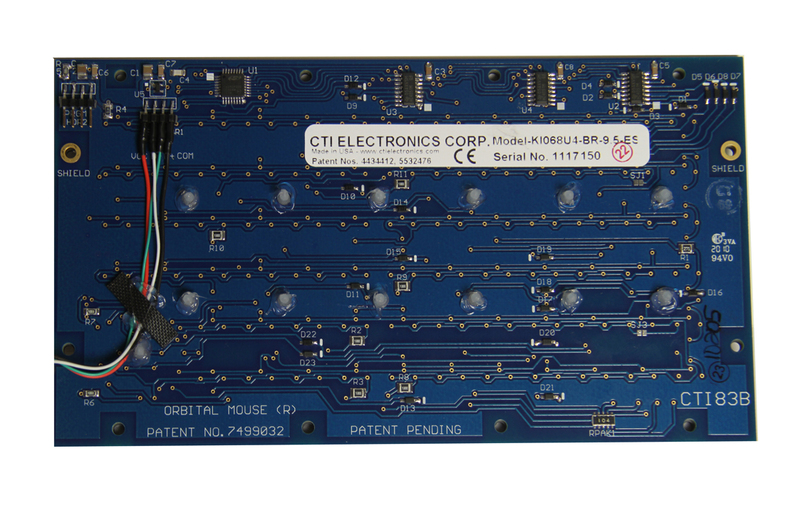 As our customer you will discover the long term benefit and value that is designed into all of CTIs human machine interface devices. The robust design and quality craftsmanship produces a level of reliability and durability that is a step above any so-called competitive "industrial grade" device. We pride ourselves in the fact that our designs have withstood the test of time. We are constantly innovating and adapting, using the best materials and technologies available today. It's reflected in the products, which can operate from one extreme temperature range to another within moments, protect against harsh chemicals, oils, and bio-hazardous materials, and provide a water tight seal for ingress protection. We understand that you cannot afford the risk of throwing away or having to constantly repair cheap imitations of so called "industrialized" products. The cost of service interruption, including actual downtime, loss of materials, additional labor costs, loss of actual revenue, will negatively impact your bottom line. Your return on investment will be recognized through years of uninterrupted service, zero to little maintenance required, reduced labor costs along with employee frustration/aggravation levels, and most importantly your customers' satisfaction. Commercial off the Shelf (COTS), factory direct, pricing is provided to our clientele which consists of Original Equipment Manufacturers (OEMs), Systems Integrators, and commercial end users from a wide variety of industries such as industrial processing, medical, military, off-road equipment and aerospace. 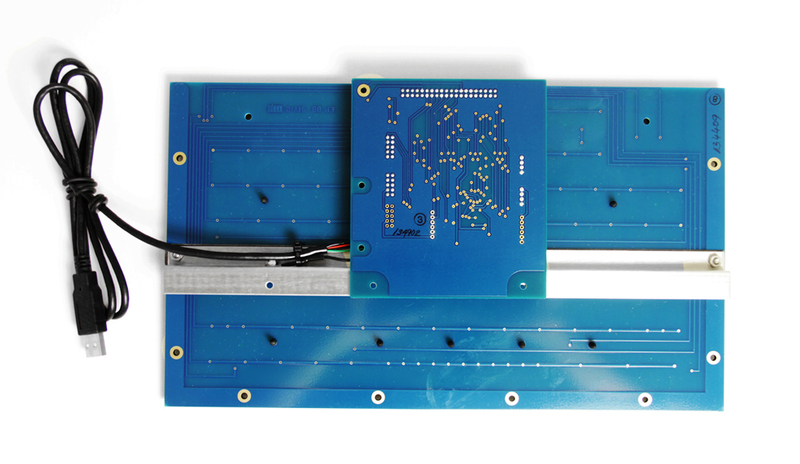 CTI's innovative modular design allows customized solutions to be rapidly prototyped from build to print specifications into a full production rollout. Our technical staff offers free consultative advice as to which manufacturing options are the most appropriate based upon the requirements of the application. 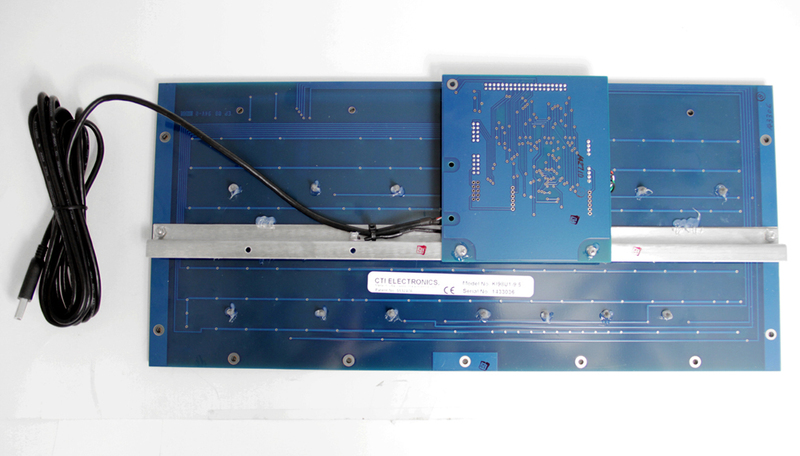 To obtain a specific price quote please use the Request for Quote (RFQ) form. 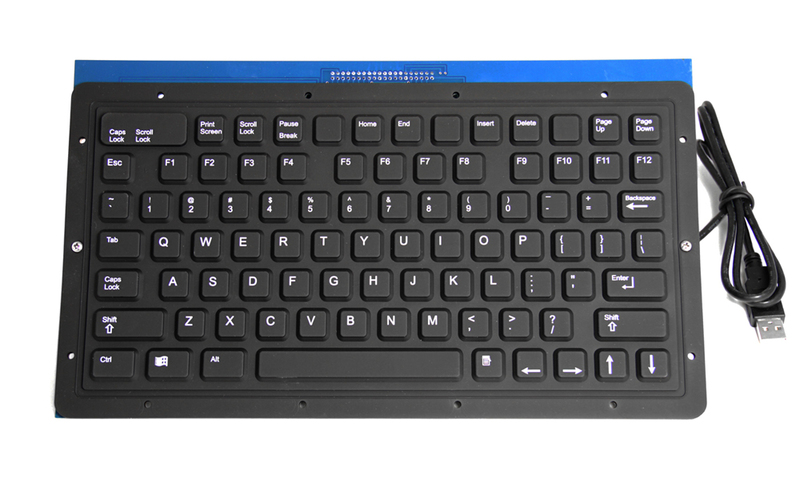 Optionally, if you are unsure of the manufacturing options for the application then call us for our recommendation or use the general inquiry form. 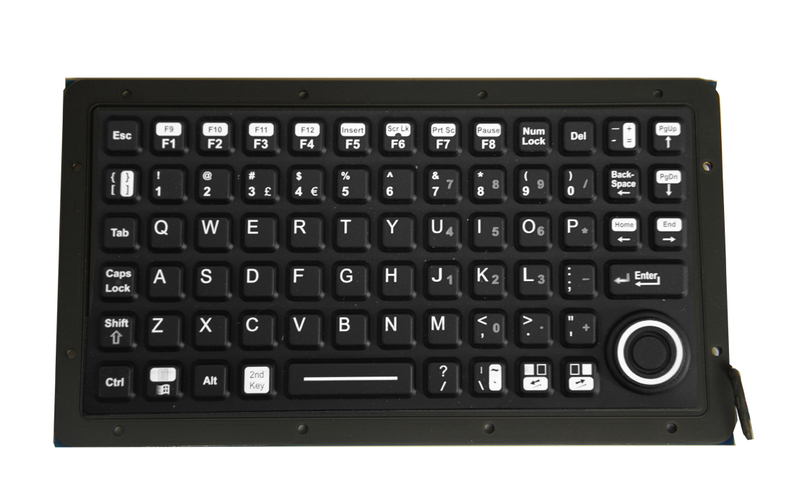 The KI9800 Series are full size, NEMA 4 (IP66) sealing keyboards with full 101/104 key functionality, including 24 function keys and a separate numeric keypad. 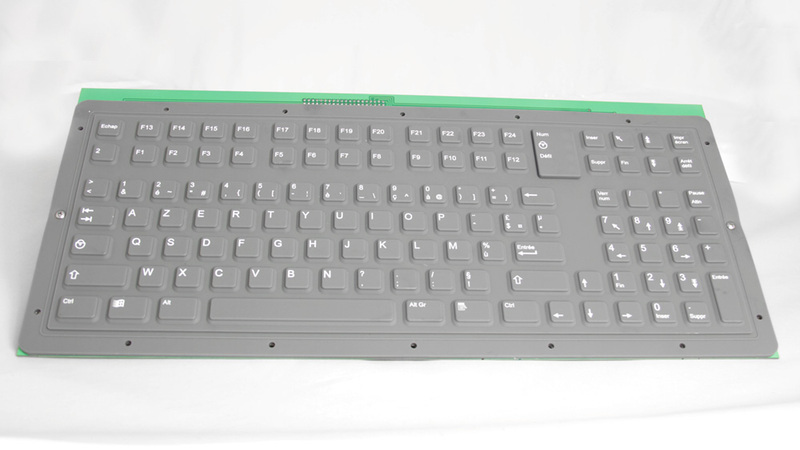 These rugged, OEM keyboards use CTI's advanced designs for sealing and reliability, are molded of silicone rubber and have 2 mm travel with excellent tactile feel. Gold over nickel contacts combined with superior sealing (waterproof) assure users of years of reliable operation. 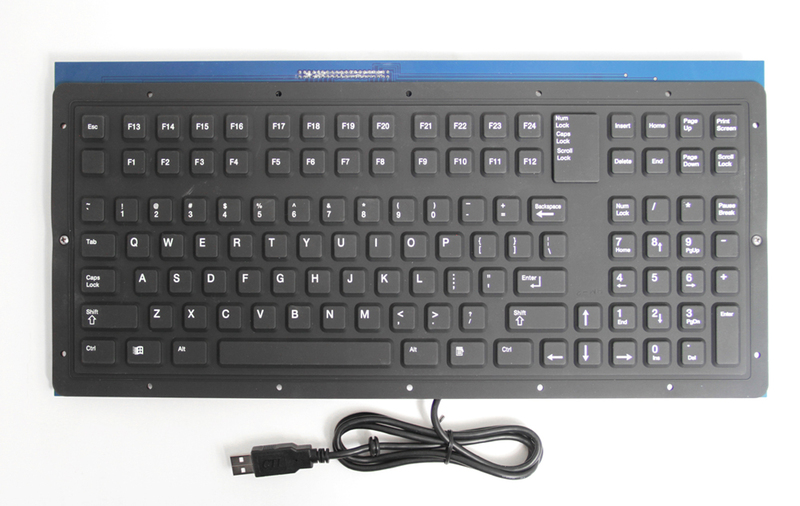 These OEM input devices are a perfect fit for custom panels, and are an excellent solution for use in wash down areas; such as food processing, medical laboratories and machining factories. 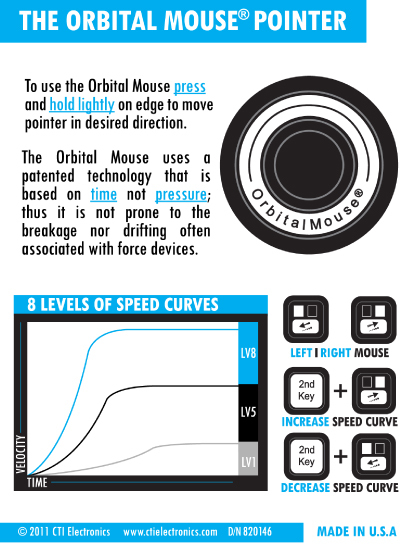 ArrowMouse™ mouse pointers offer high reliability and ease of use. 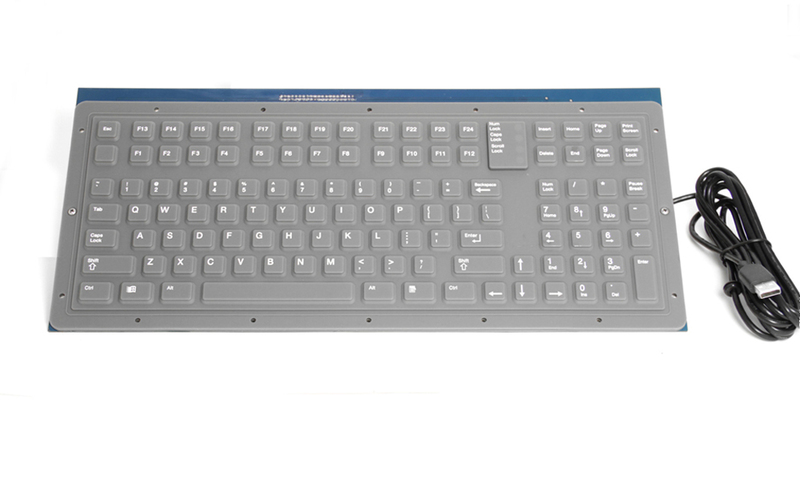 This series of OEM keyboards are a perfect fit for custom panels, and are an excellent solution for use in wash down areas; such as food processing, medical laboratories and machining factories. 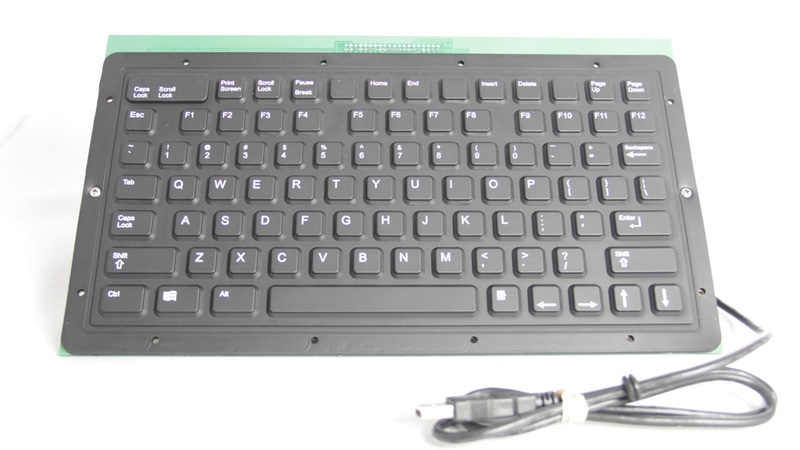 Contact Keys: "Hard" gold plated switch contacts. 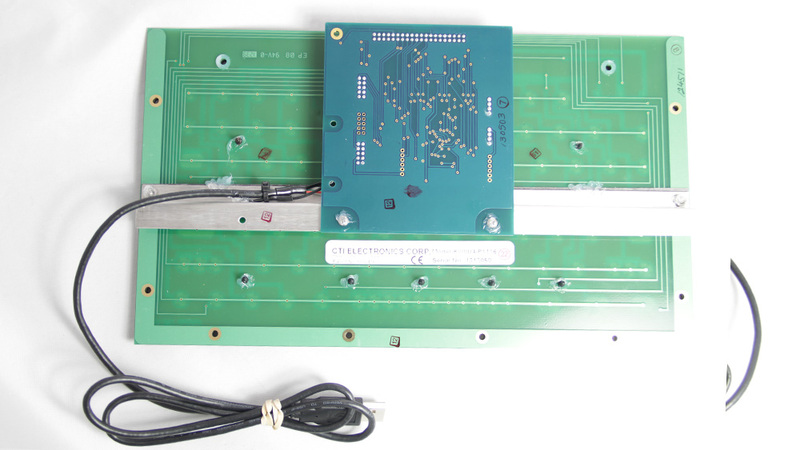 A minimum of 30 to 50 micro inches of Gold over 100 micro inches of Nickel over Copper on switch contacts. 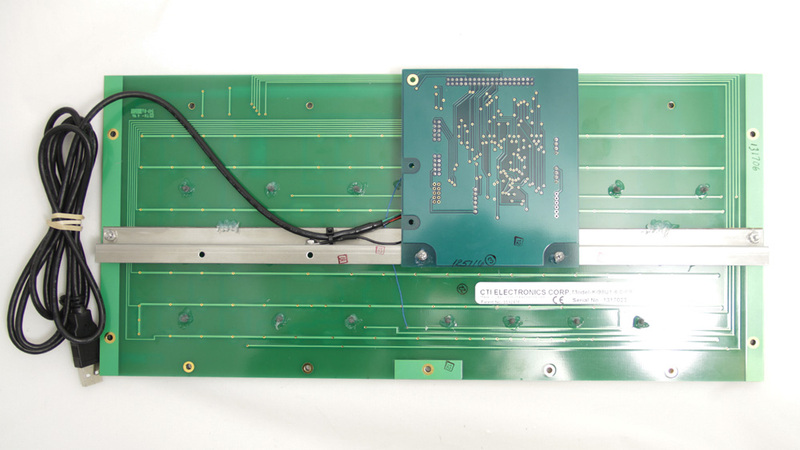 CTI uses a minimum of 30 to 50 micro inches of Gold over 100 micro inches of Nickel over Copper on our keyboard switch contacts. 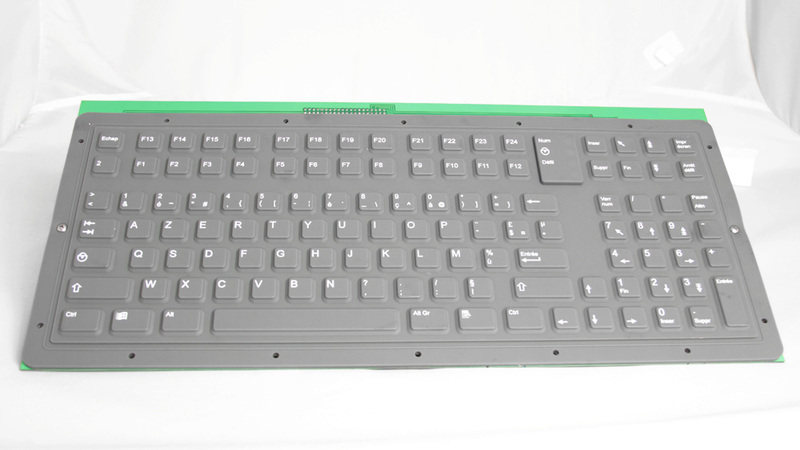 The KIO6800 Series are NEMA 4 (IP66) sealing industrial keyboards with full 101/104 key functionality in a patented, innovative small foot print. 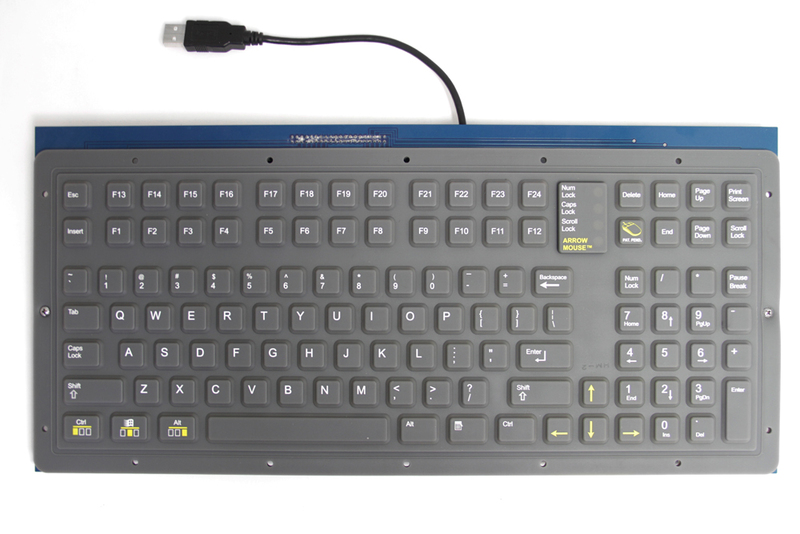 These miniature keyboards include an embedded numeric keypad (patent pending), and are combined with CTI's trackpad alternative the OrbitalMouse® button style mouse pointer. 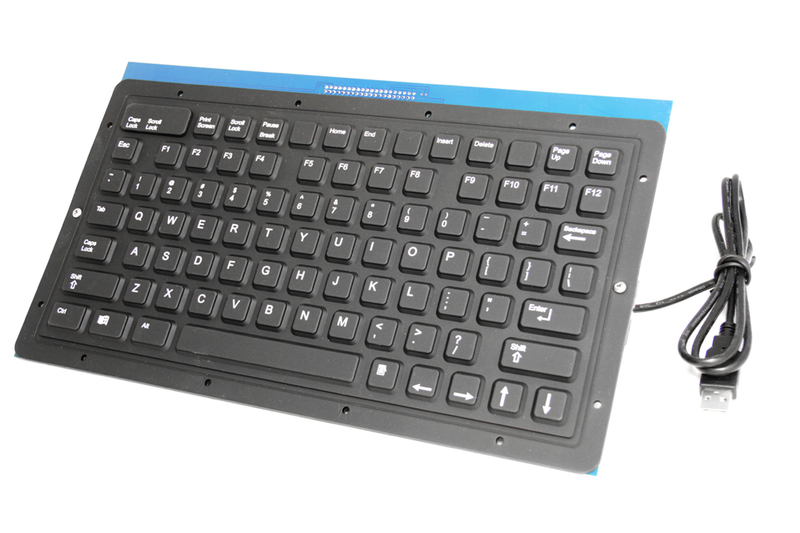 CTI's OrbitalMouse® is a sealed NEMA 4 (IP66), drift-free, button style industrial pointer, and is molded in silicone rubber; making it more user friendly and durable than a touchpad, the OrbitalMouse® also has 8 selectable mouse pointer speed curve control settings. 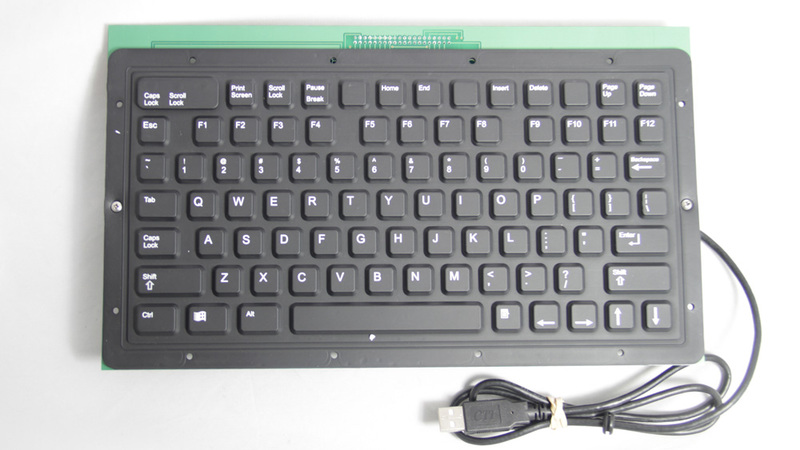 These OEM keyboards use CTI's advanced design for sealing and reliability. 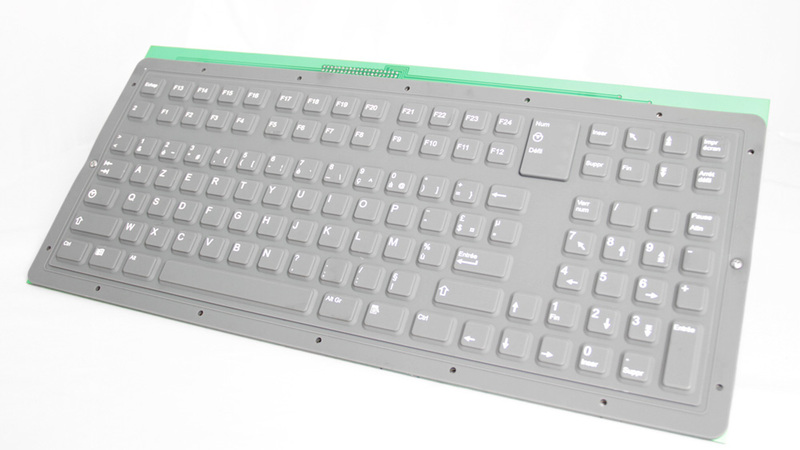 They are molded of silicone rubber and have 2mm travel with excellent tactile feel. Gold over nickel contacts combined with superior sealing (waterproof) assure users of years of reliable operation. 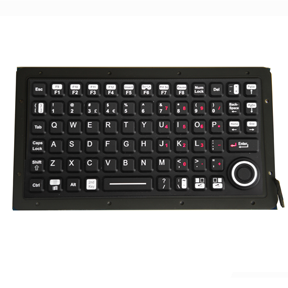 These mini keyboards are a perfect fit for custom panels, and are an excellent solution when portability and space are a consideration; such as military, security, commercial fleet vehicles, marine vessels, and medical equipment carts. The KIO6800 Series is also available in anodized aluminum or stainless steel enclosures rated at NEMA 4/4X (IP66). 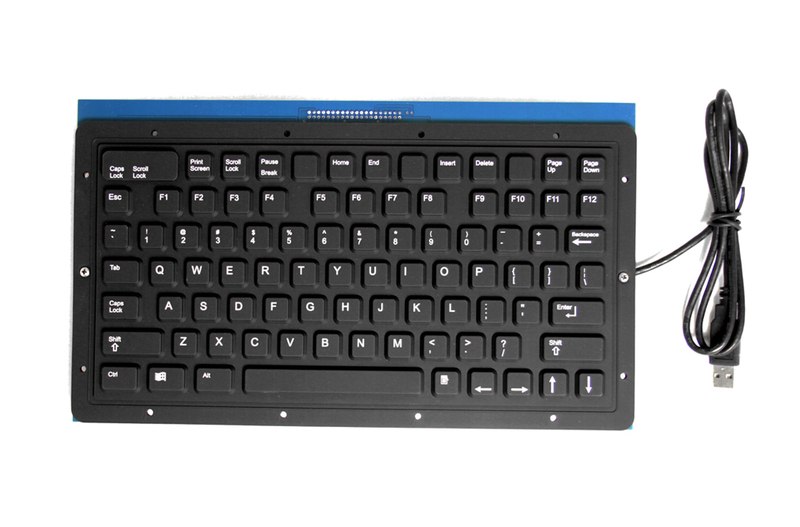 The KIO7800 Series are NEMA 4 (IP66) sealing industrial keyboards with full 101/104 key functionality in a patented, innovative small foot print with full size keys. These rugged keyboards include 12 function keys, a separate numeric keypad, and are combined with CTI's touchpad alternative OrbitalMouse® button style mouse pointer. 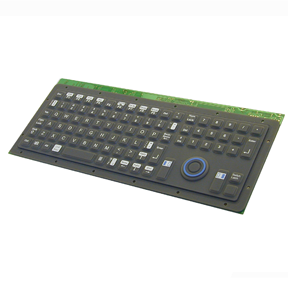 These OEM industrial keyboards use CTI's advanced design for sealing and reliability. 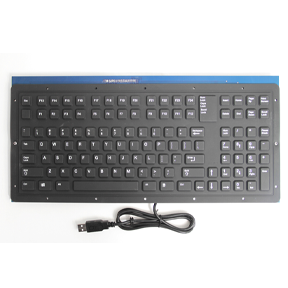 They are molded of silicone rubber and have 2mm travel with excellent tactile feel. Gold over nickel contacts combined with superior sealing (waterproof) assure users of years of reliable operation. 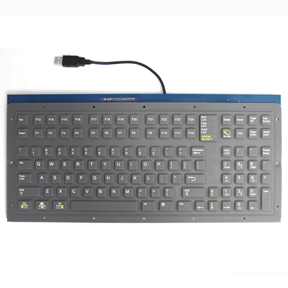 This series is designed for continuous use in harsh environments, and is also available as anilluminated keyboard; for areas with low level lighting.